Offer your horse the ultimate in fly protection and a safe alternative to toxic and ineffective fly sprays. 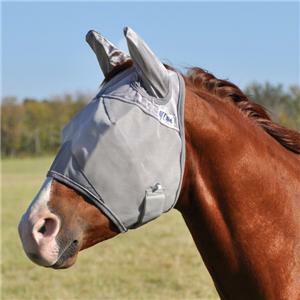 Rated #1 for comfort, design and fit by equine clinicians and publications, the Cashel® Crusader™ Fly Mask employs a patented three-hole cap design that ensures comfort, eliminates forelock damage and remains stationary whether your horse is in the stall or the pasture. The panels are constructed of soft-coated nylon micromesh that hovers above the skin’s surface, protecting the soft tissues of the eyes and forehead from flying insects and blocking 70% of the sun’s damaging UV rays. Edges and seams are bound with low-nap plush fabric that won’t attach to irritating burrs or bristles. The Crusader™ with ear protection allows your horse’s ears to slip lightly and comfortably into fitted sheaths made of Wickaway. This soft, moisture wicking material is light and silent, allowing unobstructed hearing and full range of movement while completely protecting your horse’s ears from biting flies and gnats.